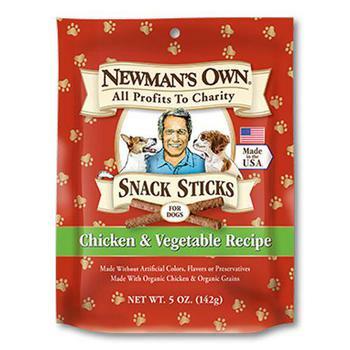 Newman's Own Snack Sticks are made without artificial colors, flavors or preservatives. These tasty treats include organic chicken, grains and vegetables. Newman's Own Snack Sticks are great as a soft, everyday dog treat. Organic Chicken, Organic Oat Flour, Organic Barley Flour, Soy Grits, Cane Molasses, Dextrose, Glycerin, Salt, Dried Cultured Skim Milk, Organic Carrots, Organic Peas, Natural Flavors, Oil of Garlic, Tocopherol (Vitamin E).